Recently high profile Italian gay designers Dolce and Gabbana had a go at couples who had created “synthetic” children by way of IVF. As a result Elton John and David Furnish posted happy family pictures on Twitter said they would boycott D&G wares. Victoria Beckham rallied in support. Maddona gave a little Twitter sermon and Courtney Love said she would burn her D&G clothes. Storm in a test tube – they are all friends again now. Anyway I had a look at the D&G obsession with “real” families and found some interesting images. The Italian design duo love glossy, high-profile advertising campaigns. The adverts often feature imaginary, posed, families, expressing the South European, Roman Catholic ideal of young parents, several gorgeous children, three generations of raven (or silver) haired beauty. Dolce and Gabbana have used the same theme again and again over many years, and clearly it sells clothes. If you want to look authentically Italian buy our frocks – drink an espresso, pick a lemon off the tree, and imagine stopping for a chat with three or four old fellows sitting in the square, on long, warm summer evenings. Obviously if you are selling “designer” clothes for men, women and children, it makes sense to pose families rather than just the specific group. People can then feel they are buying into a perfect lifestyle where there is never mess, sick, stretch marks or poverty. The slightly brown, sepia tones similarly imply an old-fashioned vibe, although I am pretty sure the same female model appears in both these families – maybe she leads an interesting double life. 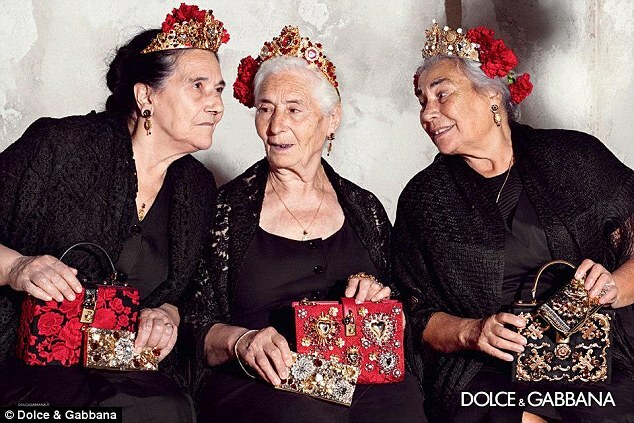 So D&G – are these families more real than Elton’s or are they “synthetic” families? Gay or straight, synthetic or real, family life is a lot more complex, and interesting, than these idealised images project. Sometimes advertisers use “real” people in their shots, rather than impossibly beautiful people without blemishes. Although the look may change the objective remains – the adverts still aim to sell us a handbag. This summer the Sicilian duo are celebrating Spanish influences and produced a charming photograph of three Nonis pretending to have a gossip. On their laps not a scraggy bit of crochet or a yellowing newspaper but D&G bags and purses – costing thousands of Euros a piece. Bet it sells even more of the D&G brand. Then the Nonis will launch themselves onto the Eurovision stage stealing the hearts of the undergrandparented. Watch out Nonis, the Aussies are joining you this year for the first time – yay, Eurovision! Are you making fun of my lemon-sniffing picture from last week? 🙂 You know, the birth rate is so low in Italy that I would think many potential nonni would be happy to have any children (as would the public pensions system). No! But I knew you would notice. The thing is I have this fantasy – being able to get a fresh lemon from the garden to grate into a pudding or slice into a drink. Interesting point about the falling birth rate. Personally I’m a fan of adoption. Sometimes I wonder if others understand overpopulation and creating barriers that aren’t achievable for all. Sorry I digress.